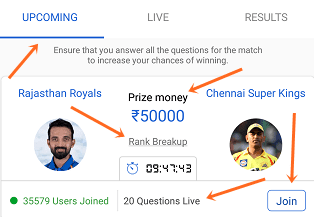 GameOn is a free Fantasy game (Prediction platform) for Indian users where you can win Cash prizes by answering questions and making predictions for sports like Cricket, Tennis, F1 and football. Currently, cricket, football, tennis and F1 are the only sports that you can predict for. Usually , prize money for cricket matches are way higher than other sports. 1. Download the GameOn app from Play Store. 2. Open the app. You’ll be automatically taken to the registration page. Here, enter your name, email ID, mobile number(that your Paytm wallet is created with, as your winnings will be sent to the number you register with) and this referral code: Himans2572 and tap the 'Continue' button. 3. An OTP will be sent to your account which the app will automatically detect to verify your mobile number. 4. Now upload your profile picture or skip this. 5. Select Language- English or Hindi. 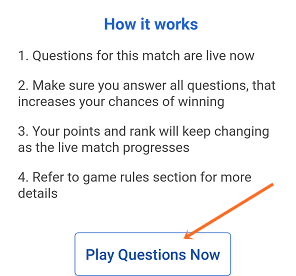 Here’s the short version: You select an upcoming match from the “Upcoming” tab and answer question/make predictions. And after the match starts you can view your rank and live score. Whether you win or not(and what you win) depends on your rank and your rank depends on your score. From the top(center) of the screen select the sport you want to play for- Cricket or Football. You can tap the 'Rank Breakup' button to see the prize distribution. As you can see in the screenshot below, Rs. 50,000 is prize money which will be distributed among 18,000 users. Hit the button shown in the screenshot above. 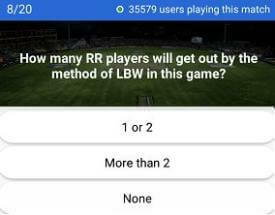 Now questions will be displayed with a number of options. As you can see in the screenshot below, this is a knowledge-based question. Usually, first 3-5 questions are knowledge-based. Prediction starts after that. So to win on GameOn not only you need luck but knowledge too. Select answers to all the questions that appear. And that’s it. Remember, you can’t change your answer after it has been submitted. Your answers are submitted immediately after you choose an option. You can check your rank when the match is live. Your rank is based on the number of correct and incorrect answers/predictions you make. So as the match progresses your rank may change. For every right answer you will get 2 points and -1 for every wrong answer. You will also get 3 extra points when you answer(predict) 3 question right in a row. And extra 5 points for answering all the questions for a match. The winners are decided depending upon their scores(rank) and time taken to answer all questions. Winners are announced 10-30 minutes after the match. 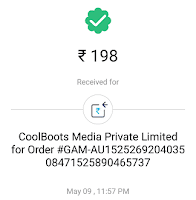 Cool Boots Media apps always have great referral programs and GameOn is no exception. 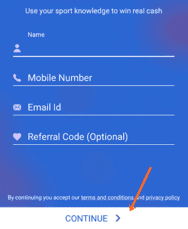 Like Qureka you will earn Rs.10 -they have reduced the invitation earning- Rs.5 for every friend that signs up with your referral code. And when they win you get 50% of the winning prize. You must have played that match, that your invited friend won, to get 50% of the prize. 1. You invite your friends and they register with your referral code. 2. 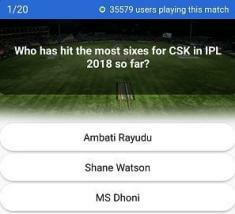 Rs.5 will be added to your account when they play a match and the result is announced. 3. When your referred friend wins a game that you have also played you too will get 50% of the winning prize. You can find your referral code by going to the Invite & Earn More section from the menu. You can withdraw after you have played at least 10 matches. Before each withdrawal, you must play 10 games. The maximum amount that you can redeem is Rs. 300. There wasn't any limit on the number withdrawals a while ago. But now you can only withdraw once every 7 days. And recently they threw another criterion- To redeem you need to have won in any match in the last 7 days before redeeming. GameOn is developed by ‘Cool Boots’ the same team that developed Qureka. So there is no question as to whether GameOn is legit or not. 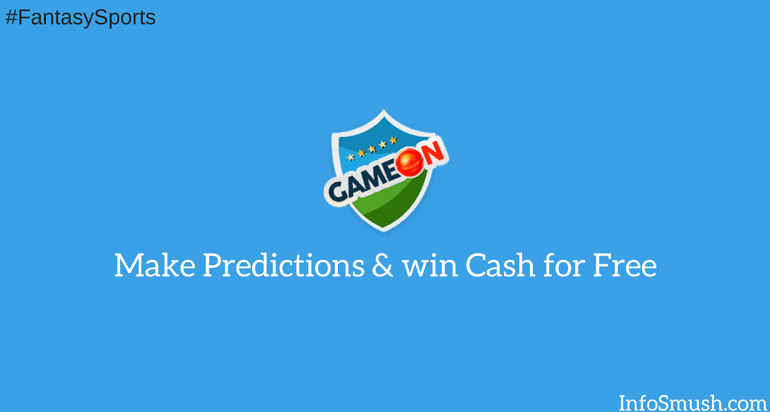 GameOn is the best app available for Android users where you can win Paytm cash by predicting for your favorite sports- Cricket, tennis, F1, and Football. Ever since Rooter got rid of Paytm and Amazon vouchers I've been looking for good predict & earn apps. And I found a few too. But they weren't as good as GameOn. If you are a regular visitor of InfoSmush you know those apps. None of those apps is as high paying as this one. Not only is GameOn free but you can earn Rs. 2-500 per match. And you can earn Rs. 5 per friend that enters your referral code and 50% of what they win. It is the highest paying predict-and-win app for sports lovers in India and I recommend it. Comment below the apps that you make money with using your sports knowledge. 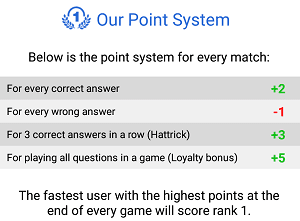 What will happen if there are multiple users with the same number of points? and Can we redeem the referral bonus to paytm wallet? Your rank also depends on the time taken to answer questions. So same amount of points does not mean that users will have the same rank. 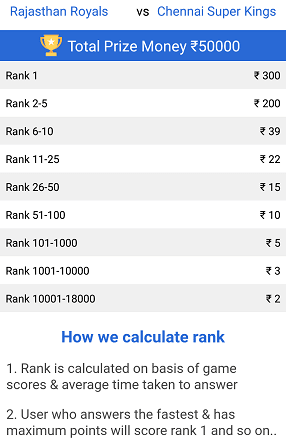 If two users have the same rank, prize money will be split equally. 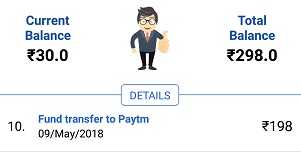 Yes, you can redeem your referral bonus to paytm. How long will it take for the referral bonus to be transferred to my account? After your friend has played a match and the results are announced.